It is always a privilege to be asked to review a text that lights up the shelves of the medical section. The last was the Point of Care Ultrasound Handbook, now this from a good friend of mine, Dr Nitin Arora and his co-author Dr Shondipon Laha. It is a testament to the authors who listened to feedback via social media, active listening forums, peers and trainees alike and responded with this second edition. It has been almost completely re-written and greatly expanded. There are new chapters on ultrasound, social media, stress and burnout, research, the ICU team and many others. The contributor list is vast and packs some ‘beef’, too! There are many names within the cloud, many of which you will notice are active behind their Twitter handles, at conferences speaking and experts within their fields. Each section always finishes with some well tuned key learning points. Which allows the reader to consolidate the text into take-home and use points. So, what is this text all about and why should you go and buy it? Opens out with the basics, what the ‘nitty gritty’, of the shop floor holds for new starters. ICU can be a daunting job, particularly if at the more junior end of the scale. Your first day and what to expect – breaks down the average ICU day into its ‘what to expect’, components, including ward round etiquette and terminology not to get bamboozled over. The daily review of a patient – fabulous section here on a recommended system of review, includes the kitchen sink! This area is always a tad contentious when you start out, but it gives the reader a chance to commence with a ‘belt and braces’ approach, to later fine-tune relevant areas for poignant handover. Communication – this section gives us some gold-dust pointers into how communication as an ICU doctor forms the absolute foundation of what we do. It includes SPIKES model for breaking bad news, and includes pointers on how to communicate well within and without the hospital. Capacity and consent – deals with areas we all dread…D.O.L.S, safeguarding and more. Also breaks down and discusses the contention behind consent in the unconscious patient. 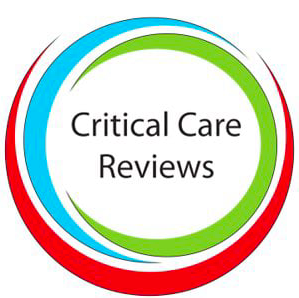 Research in intensive care – a rather nice ‘how-to’, guide to R&D within critical care. It’s not an easy forum. But with the advice of Gavin Perkins, perhaps we get a bit more clarity. Stress and burnout in intensive care medicine: Looking after yourself – you will have seen a lot about this of late, so getting some insight into how to look after yourself and your team is invaluable; Segun Olusanya and Adrian Wong are well spoken in this area…worth thinking about their prose. Excellent! Here the authors discuss the important roles of the multi-disciplinary team on ITU. Written by some of our fabulous allied health professionals. A refreshing section that highlights the ‘T’ for teamwork within I ‘T’ U.
Assessing ICU referrals on the ward – an excellent section here, dealing with the typical; A to E approach to management, then leading in to various recipes of patient subtype. By this, we mean, those who can stay on the ward, those who need further outreach care; right to full level 3 escalation. It also runs through how to prepare the unit for the arrival of the new admission. Assessment and management of major trauma patients – poignant parts to the MTC and working within the busy environment it presents. Everything from nuances of C-spine control to the hazards of RSI are included here. Management of the head-injured patient – neuro ICU or not…this section brings you right up to date with what is important in the head injured patient. What BP to aim for, what else to normalise, concise targets, who to contact, how and when. Everything included in a clear concise fashion. Initial management of the patient with burns – lovely section including a brief guide to fluid resuscitation in this difficult subset of patients. Very well written and easily transferrable to novices and more experienced clinicians. Drugs! I love the conciseness and direct applicability of this section to the root of ICU management. There is a no-nonsense dosing guide included within each section, as well as some of the pearls and pitfalls of prescription for staff and patients. The authors even tackle nutrition…an area many of us are often lacking in the knowledge department. Equipment. A fabulous section looking into what can be, from the outset, rather confusing to those starting out on the ITU. Ventilators are tackled, RRT is grappled beautifully by Aoife Abbey and monitoring is made palatable. An exciting inclusion for me in particular, is the section on POCUS. This is a growing and exciting area within critical care, with many ACP’s taking it on these days. It is written by 2 clinicians passionate within the field, Dr Adrian Wong and Dr Segun Olusanya. There are also many fabulous images to put ‘faces to the text’, included. I commend them for this. The section concludes with a brilliant exploration into ABG interpretation. This is something we all take for granted as we look at 20 plus sets of values every day (to say the least). These form the bread and butter of ICU management. Akhtar and Hull take this on and shine! ICU emergencies. Many books in themselves have focussed on this area alone, so presenting it in a relatively short section is no mean feat! This is done with panache by the authors. Maintaining an airway, Rapid sequence induction, Endotracheal tube and tracheostomy problems, Fighting the ventilator and Pneumothorax all feature here. ‘Other emergencies’. Arrhythmias, to hypoglycaemia, to status epilepticus, right through to poisoning are included. The arrhythmia section includes some rather nice ‘traces of doom’, within it, so that these may be recognised by practitioners and dealt with. There is also a lovely section on the management of the critically ill child, including drug dosing schedules. The poisoning section takes us through many culprit drugs and frequently seen offenders, with management plans for each. Part 8 forms the final section of this book and is the pièce de résistance! The authors tackle the ‘big ICU culprits’. Look at the list! Some list! Each section though, can be read rapidly…almost as you are about to deal with the situation in hand. A lot of time and effort went into the first edition of this book. I am bamboozled by the high-end contributor list and the end result of all of their hard work under Arora / Laha, to produce an even better second edition! I cannot emphasise enough just how useful this is as a text for senior ITU physicians, for our juniors, our nursing staff and AHP’s. I suggest if you have the time, go down tom the local, yes, book shop (they exist), and pick up a copy. Alternatively, click the link below to pre-order your copy now! **The review edition was Kindly sent to me by the authors and I must thank them accordingly. I also would like to congratulate them on all of their, and the contributors’ hard work. I know how hard this can be, having edited one of the Oxford Handbook Series in the past.